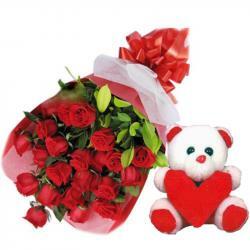 Product Consist : Basket Arrangement of 25 Red Roses with Balloon along with Cute Teddy Bear (Size - 12 inch). When it comes to surprising to love ones on special occasions like Valentines Day, this gift combo should be on top of your list. 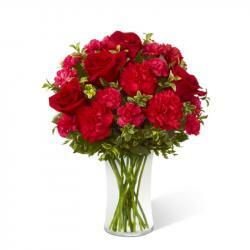 This contains a charming and super cute 12 inch teddy bear and The Stunning Basket of twenty five alluring red Roses. The flowers are nicely arranged in Basket to add some romantic affect with Balloon. It is decorated with ribbon bow which looks amaze. 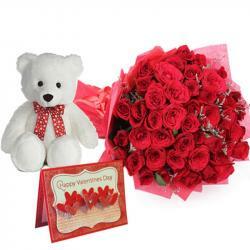 So buy it now Product Includes: Basket Arrangement of 25 Red Roses with Balloon along with Cute Teddy Bear (Size - 12 inch).